The Glorious Foods of Greece is the magnum opus of Greek cuisine, the first book that takes the reader on a long and fascinating journey beyond the familiar Greece of blue-and-white postcard images and ubiquitous grilled fish and moussaka into the country’s many different regions, where local customs and foodways have remaained intact for eons.The journey is both personal and inviting. Diane Kochilas spent nearly a decade crisscrossing Greece’s Pristine mountains, mainland, and islands, visiting cooks, bakers, farmers, shepherds, fishermen, artisan producers of cheeses, charcuterie, olives, olive oil, and more, in order to document the country’s formidable culinary traditions. The result is a paean to the hitherto uncharted glories of local Greek cooking and regional lore that takes you from mountain villages to urban tables to seaside tavernas and island gardens.In beautiful prose and with more than four hundred unusual recipes — many of them never before recorded –invites us to a Greece few visitors ever get to see. Along the way she serves up feast after feast of food, history, and culture from a land where the three have been intertwined since time immemorial.In an informed introduction, she sets the historic framework of the cuisine, so that we clearly see the differences among the earthy mountain cookery, the sparse, ingenious island table, and the sophisticated aromaticcooking traditions of the Greeks in diaspora. In each chapter she takes stock of the local pantry and cooking customs. From the olive-laden Peloponnesos, she brings us such unusual dishes as One-Pot Chicken Simmered with Artichokes and served with Tomato-Egg-Lemon Sauce and Vine Leaves Stuffed with Salt Cod. From the Venetian-influenced Ionian islands, she offers up such delights asPastry-Cloaked Pasta from Corfu filled with cheese and charcuterie and delicious Bread Pudding from Ithaca with zabaglione. Her mainland recipes, as well as those that hail from Greece’s impenetrable northwestern mountains, offer an enticing array of dozens of delicious savory pies, unusual greens dishes, and succulent meat preparations such as Lamb with Garlic and Cheese Baked in Paper. In Macedonia she documents the complex, perfumed, urbane cuisine that defines that region. In the Aegean islands, she serves up a wonderful repertory of exotic yet simple foods, reminding us how accessible — and healthful — is the Greek fegional table.The result is a cookbook unlike any other that has ever been written on Greek cuisine, one that brims with the author’s love and knowledge of her subject, a tribute to the vibrant, multifaceted continuum of Greek cooking, both highly informed and ever inviting. 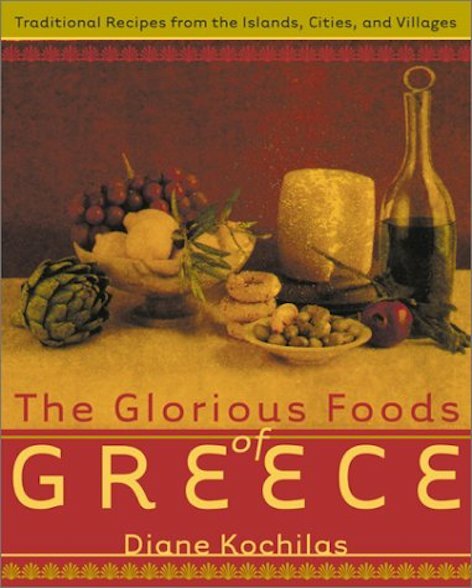 The Glorious Foods of Greece is an important work, one that contributes generously to the culinary literature and is sure to become the definitive book of Greek cuisine and culture for future generations of food lovers — Greek and non-Greek alike.